$32.95 for FJ Inner Circle Members. Balance your crown chakra and ward off negativity with our Amethyst Druzy Candle and Bath Bomb Gift Set from the Druzy Collection. Feed your soul as fresh citrus and wild berry mix with sweet African Tulips, jasmine, and red guava before sweet agave and sugarcane relax your mind and bring you to peace. Known to ward off emotional and physical ailments, our bath bomb complements our candle surrounding you in deep violet as the bath bomb melts into a shimmering sea of purple hues. But before your time in tranquility is over, your set will reveal a ring and a pendant with a real, glittering amethyst druzy, as well as a code with the chance to win a ring worth up to $10,000 through our Enter the Vault Sweepstakes! This is it, savasana . . .
Each candle contains a beautiful natural druzy pendant and a code that gives you a chance to win a ring with a retail value between $100 and $10,000! 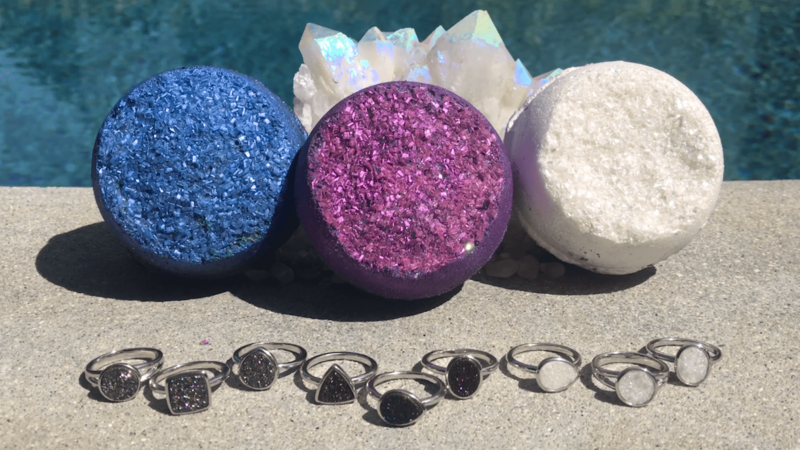 Each Bath Bomb contains a beautiful natural druzy ring and a code that gives you a chance to win a ring with a retail value between $100 and $10,000!